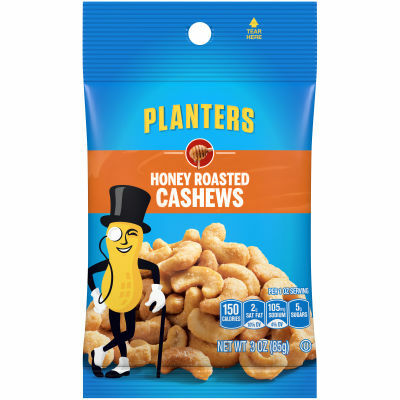 Honey Roasted Cashews A delicious blend of salty and sweet flavors, Planters Honey Roasted Cashews are the perfect snack to tickle your taste buds. Packed with nutrients and flavor, these cashews offer a bold crunch and delicious flavor that is sure to satisfy your snack cravings at any time of day. Sweet, Crispy, and Healthy These golden, honey-roasted cashews offer a delicate, sweet flavor, and the hint of sea salt balances out the sweet taste for perfect harmony. Bursting with sweet, salty flavors and substantial nutrients, these nuts are a must-have to for your snack emergencies. You can add these scrumptious cashews to your salads or enjoy them on their own. This package contains one 3 oz bag. Serving size 1 oz (28g/about 25 pieces).